This 18" wide step rug gives you a place to wipe off your feet so you don't track dirt into your RV. The rug wraps around almost any RV step and secures without tools, screws, or glue. Call 800-298-8924 to order Camco accessories and parts part number CAM42925 or order online at etrailer.com. Free expert support on all Camco products. 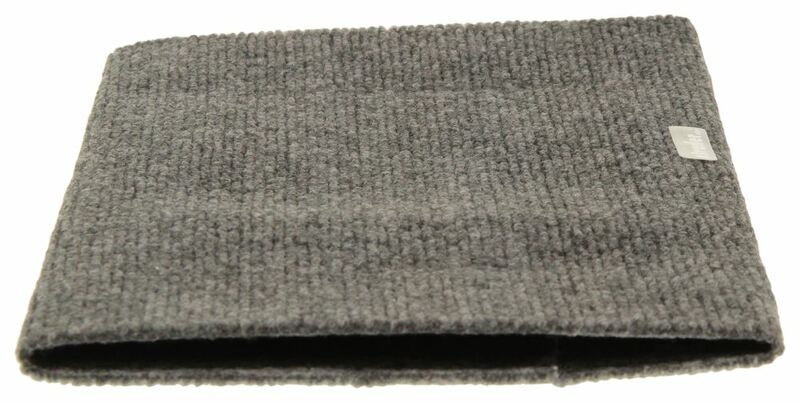 Guaranteed Lowest Price and Fastest Shipping for Camco RV Step Rug - 18" Wide - Gray. Accessories and Parts reviews from real customers. This 18" wide step rug gives you a place to wipe off your feet so you don't track dirt into your RV. The rug wraps around almost any RV step and secures without tools, screws, or glue. Lippert Components Non-Skid Tape for Kwikee Steps - 25" X 8"
Today well be reviewing part number CAM42925. This is the Camco RV Step Rug. Its going to measure 18 inches in width and its in a nice color gray. 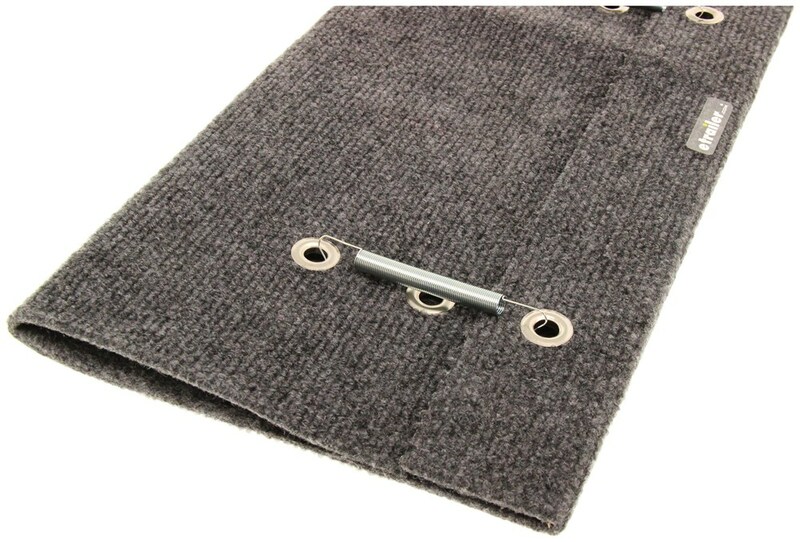 The step rug fits nicely around your manual or electric RV step so that youll track in less dirt into your RV. The carpet wraps around the step and secures to the two holes using the hooks. Theres no screws, theres no glue and you dont need any tools to install this. You can choose between the two different set of holes depending on the size of your step. This system will adjust to fit almost any RV step out there. Its made from a mildew resistant and a weather resistant material so it makes it perfect for the outdoors. Again, its in a nice color gray and we measure 18 inches in width. We have a piece of cardboard here that we will use to illustrate our step. We just wrap our carpet around there then we take one of our hooks, place it through the eyelet and then choose the appropriate mountain hole location and place the other side of the hook in there and its going to hold it nicely over our step and it gives it a nice clean look. Thats going to complete todays review of part number CAM42925. 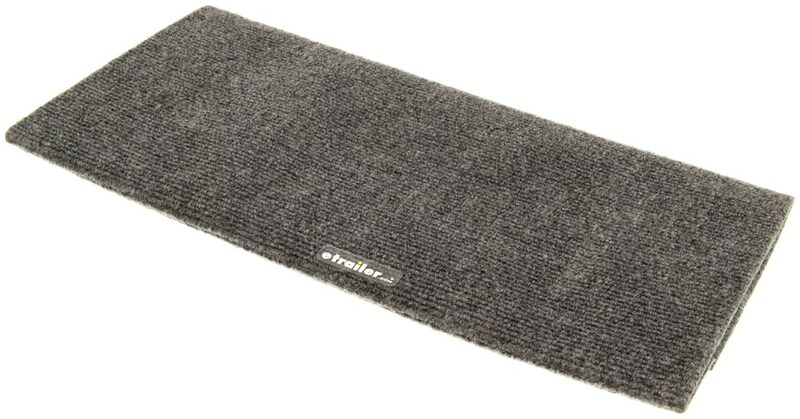 This is the Camco RV Step Rug in grey. Order: RelevanceNewestRating - High to LowRating - Low to High This 18" wide step rug gives you a place to wipe off your feet so you don't track dirt into your RV. The rug wraps around almost any RV step and secures without tools, screws, or glue. 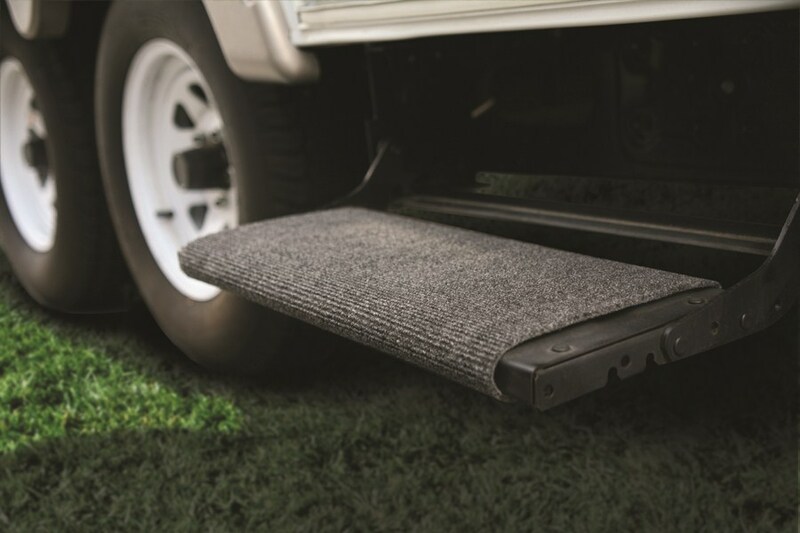 The Camco RV Step Rug # CAM42925 is 18 inches wide and is made to fit almost any RV step. It has two sets of eye holes to connect the hooks to making it more versatile to fit your steps. It measures 18 inches by 8-1/2 inches when folded. The short fold is 2-3/4 inches and the long fold is 5-3/4 inches. See the attached picture. 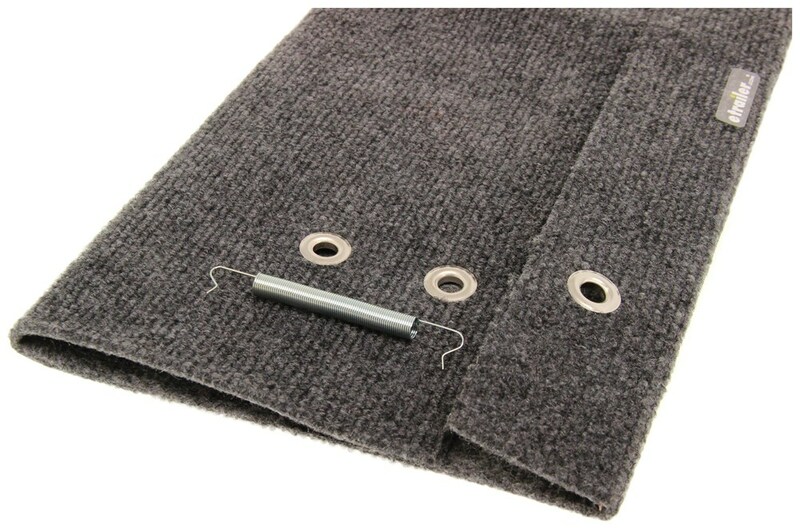 We do carry step rugs like the Camco RV Step Run part # CAM42925 which is 18 inches wide and gray in color. I attached a picture of what these look like when installed as well. You'd want to go with the 18 inch Camco RV Step Rug part # CAM42925 for your step that measures 20-1/4 inches wide. If you check out the picture I attached you can see how you'd want a slightly wider step width than step rug width.